Today is a historic day for anyone who eats. 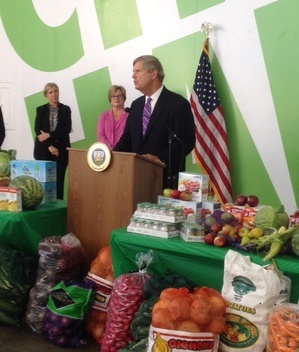 Just this morning, Secretary of Agriculture Tom Vilsack and EPA Acting Deputy Administrator Stan Meiburg announced a goal to reduce food waste across the United States by 50 percent by 2030. 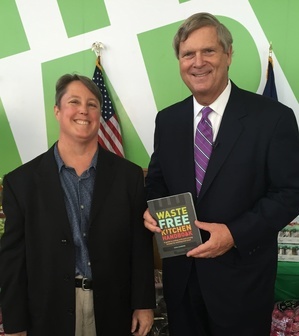 "The United States enjoys the most productive and abundant food supply on earth, but too much of this food goes to waste," said Agriculture Secretary Tom Vilsack. "Our new reduction goal demonstrates America's leadership on a global level in in getting wholesome food to people who need it, protecting our natural resources, cutting environmental pollution and promoting innovative approaches for reducing food loss and waste." This is huge. Currently, about 40 percent of the U.S. food supply goes uneaten. This not only means that Americans are throwing out the equivalent of $162 billion each year, but also about 25 percent of U.S. water supply and producing 33 million cars' worth of greenhouse gases, all for food that never gets eaten. Food is the single largest contributor to landfills today. At the same time, one in six Americans is food insecure, meaning they do not have a steady supply of food to their tables. Allowing the waste and hunger trends to coexist has been nonsensical, to say the least. Today, America has taken a solid step to change all of that. When I was first researching our initial landmark report on food waste, I remember thinking to myself "these numbers can't be real because if they were, everyone would know about them." And yet, they were. We called for national targets in that report, but at the time it seemed like a pipe dream. Now, here we are three years later, with our country's leadership not only recognizing wasting so much food is a problem, but taking a stand against it. Amazing! We join the ranks of others around the world who are calling for this waste to stop. For instance, France recently established a National Pact to halve food waste by 2025. The Consumer Goods Forum, representing 400 food retailers and manufacturers globally, established a goal of reducing food waste through its industry members by 50% by 2025. And later this month, the United Nations will ask countries to adopt the Sustainable Development Goals for 2030, one of which includes an element to cut "per capita global food waste at the retail and consumer levels" in half, and "reduce food losses along production and supply chains, including post-harvest losses." Of course, implementation will be the key to real success, and the federal government cannot do this alone. They can begin, however, by developing a robust database of baseline data against which progress can be measured over time, including assessment of on-farm losses which are currently largely undocumented. They can put more funding towards better infrastructure for food rescue organizations, who can't be expected to redistribute all the excess food out there through volunteers and donations alone. And they can create a national implementation task force charged with monitoring progress, supporting effective public reporting, and identifying strategies for supportive government action. This is an American goal, though, not just one of our government. To truly achieve these targets, we will need all hands on deck. That means the food industry--restaurants, cafeterias, grocery stores, food distributors, farmers--will need to look for opportunities to reduce waste within their operations and throughout their supply chains. And so will you and me. In fact, individuals and households are responsible for somewhere between one quarter to one half of all the wasted food out there. That's more than any other part of the food chain. Taking small steps like these in our everyday lives can help us solve this big global problem, one meal at a time. And reducing our contribution to global food waste has the added benefit of saving us money. With the average American family losing roughly $1,500 a year on uneaten food, there's room for all of us to put some cash back in our pockets! In order for our country to succeed, we as individuals will need to take this goal shopping with us, bring it home, and cook with it. Whether you get this information via the Handbook, the web, or your grandmother, know that there are easy ways to make changes to reduce your waste, and make your own contribution to these exciting new national goals.